In July of 2017, I published an article on Extraordinary Collaboration in Louisville Business First magazine. In this article, the importance of collaboration for innovation was described, along with barriers to effective collaboration, and approaches to address these challenges. The full text can be found at https://www.bizjournals.com/louisville/news/2017/07/06/strategiesyou-must-work-to-achieve-extraordinary.html . Collaboration occurs at various levels, from large organizations working together to build or initiate a new product or service, to small groups of individuals within a business working together to find innovative solutions to existing problems. A collaborative process allows people with different knowledge, experience, perspective and resources to accomplish what the individuals cannot accomplish alone. This typically happens through the sharing of expertise and the coordination of progress toward goals. And in some cases, an extraordinary new idea emerges that is truly more than a mere sum of the individual contributions. There are many barriers to achieving extraordinary collaboration. In some cases, mental frameworks prevent team members from seeing alternatives. In a desire for efficiency, these existing paradigms drive leaders to rely on what has been done in the past, instead of considering the unique characteristics of the current situation and allowing innovative solutions to emerge. Diversity of perspective and thinking style within the group are required elements for extraordinary collaboration, but they can also pose a barrier. The more dissimilar group members are from each other in background, expertise, and interpersonal style, the greater the likelihood of difficulty in communication and understanding each other’s perspectives. Attitudes and motivations of individuals on the team can also pose a barrier. Team members may be reluctant to collaborate because they have a personal attachment to one specific approach or outcome. A win/lose mentality typically works against effective collaboration. Collaborative problem solving requires the integration of multiple diverse perspectives, the generation, consideration and evaluation of new ideas, potential change and disruption to standard processes, and likely disagreements around plans and activities. Accepting and working through these issues can be slow, hard work. Here are a few tips for building effective collaboration in teams. Set Expectations. Groups collaborate for a variety of reasons; clearly defining the purpose and objectives of the work will go a long way to ensuring the team is aligned. Purpose is used as a guidepost when personal agendas become involved and objectives serve as reference points while options are evaluated and decisions are made. Establishing ground rules for how the group will work together will help establish constructive norms. Build a Collaborative Team Culture. It is important to create a feeling of trust, openness to new ideas, and shared ownership within the team. Conducting activities and discussions that require individuals to challenge their current paradigms about the topic will help establish openness to new ideas. Reinforcing team progress over individual efforts will help dilute individual concerns about personal goals and recognition. This will also serve to build trust among the group members. Develop Commitment. Working to ensure that all team members are committed to a successful outcome is important. Business necessity, or ‘the burning platform’, is often the overt method to generate commitment. A more fundamental and powerful method is ensuring that team members are personally interested in and committed to a successful outcome. Allow time for group members to reflect on how the achievement of the objective is meaningful and relevant for them personally and professionally. By intentionally and systematically addressing barriers to collaboration, extraordinary outcomes are possible. 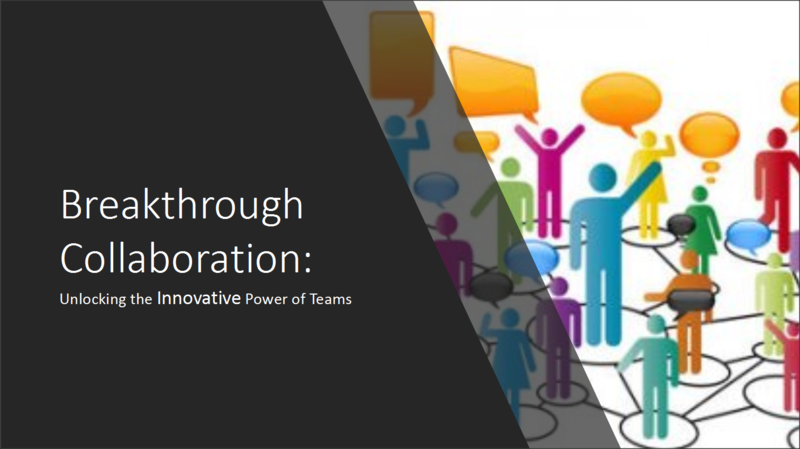 I have developed a Workshop, Breakthrough Collaboration, that is designed to help leaders understand the components of successful collaborations, and how to break down barriers and break through to extraordinary outcomes. Feel free to contact me about the details of this program.